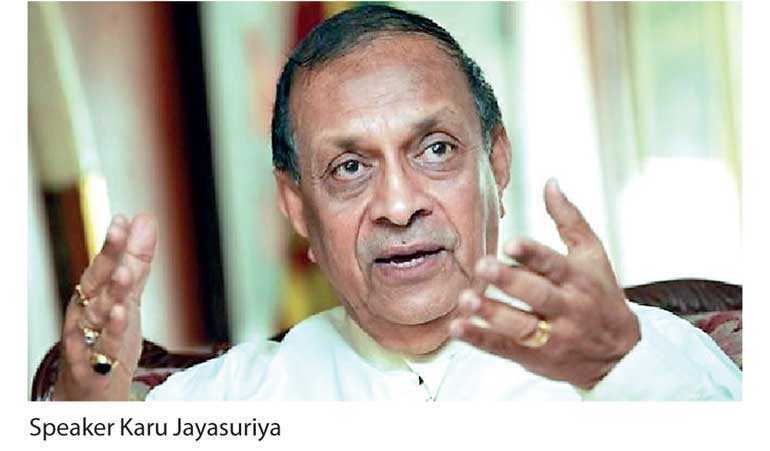 Speaker Karu Jayasuriya informed Parliament yesterday that the final decision on the Opposition leader position would be given before Friday after his decision was discussed and agreed during the party leaders meeting held last afternoon. Before reaching the agreement at the party leaders meeting, the UPFA Joint Opposition lawmakers were highly critical of both the Government and Speaker Karu Jayasuriya for not removing Tamil National Alliance (TNA) leader MP Rajavarothiam Sampanthan and establishing Joint Opposition parliamentary group leader MP Dinesh Gunawardena as the new Opposition Leader. Immediately after the moving of petitions and questions for oral answers, MP Gunawardena was seen on his feet making a point of order by raising the issue of appointing an Opposition Leader from his group. He requested a fresh determination by the Speaker on the post of Opposition Leader, considering the latest changes to the number of lawmakers in the Government and the Opposition benches. MP Gunawardena in his notes identified the UPFA General Secretary Mahinda Amaraweera as an “incompetent, ignorant, inefficient General Secretary of a party.” He made this comment with reference to the reply letter of Amaraweera to the Speaker in which he informed that the UPFA did not want any change in the post of Opposition Leader. During the ensuing heated debate lawmakers from both the Government and the UPFA Joint Opposition justified their positions bringing in prior examples and parliamentary traditions. In the absence of MP Sampanthan, TNA MP M.A. Sumanthiran challenged the JO to leave the UPFA and sit independently and seek the main Opposition leader position. “The Leader of Opposition post cannot be held by a person who belongs to a party that has members in the Cabinet. The UPFA Chairman, its General Secretary and over 20 members are members of the Cabinet and are part of the Executive. It will be a mockery to have yet another UPFA MP sitting as the Opposition Leader as well,” he stressed. Agreeing with the TNA’s remarks, JVP MP Bimal Rathnayake held that the entire Cabinet should first resign if an UPFA member is to get the post of Opposition Leader because there can no longer be a national government after that. “The number of ministers was increased under the pretext of forming a national government. If the UPFA is given the Opposition Leader post then the number of ministers should be limited to 30 under the 19th Amendment to the Constitution,” he argued. Meanwhile, MP Dullas Allahapperuma noted the 70 MPs of the JO represent 31% of the total 225 MPs in Parliament, while 16 TNA MPs represent only 7%. UNP MP Thushara Indunil said the UNP backbenchers would also cross over to the Opposition and demand the rights and privileges given to an opposition group if this trend continued. Chief Opposition Whip and JVP Leader Anura Dissanayake suggested that the JO could rightfully claim the Opposition Leader post if they, who claim to have 70 MPs, grab the power of the UPFA executive committee, defeating the 23 members aligned with the Government.